← An Essential Oils Diffuser, Your Very Own Stress Buster! In addition to the reeds and container and your chosen essential oil, you also combine a range of accessories and scented candles. 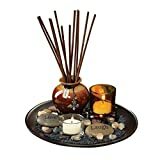 You will also need a tray, shallow dish or other suitable container on which to stand all the elements that you collect together for your reed diffuser garden. Scented candles are always a good choice for additions to your reed diffuser garden but you must be sure to place them in a safe position where they will not get knocked over or come into contact with anything flammable. 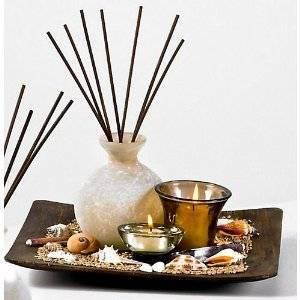 I have shown some ideas for combining different elements and also provided some suggestions for choosing the fragrance for the diffuser, according to the area or room in which you want to place it. Entrance; Refreshing scents such as citrus, lemongrass and ginger are best for living rooms or in the hall or entrance as they are so welcoming, fresh and inspiring. 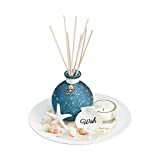 Living area; Some fragrances to add in your reed diffuser are lilac, pear, black cherry, fresh linen, apple spice, cinnamon, sweet pea, lavender vanilla, vanilla lime or vanilla are good choices. These can be used in the dining room or living area. Kitchen; You may prefer to use an epicure scent in the kitchen, so scents like cinnamon, vanilla and orange seem to work best there. There are also aromas that are evocative of baked goods – for example cheesecake, chocolate, apple pie, sugar cookies and lemon chiffon pie. Drawing rooms; Exotic scents include jasmine, frangipani, hibiscus and other stifling flowers. These can be used in your drawing-rooms to make your guests feel welcome. Corridors; Gentle tones are labelled with soothing names, such as ocean breeze, beach and evergreen forest. These are good to add in your corridors and hallways. Bedrooms; choose fragrances known for their relaxing and soothing properties such as lavender if you find falling asleep difficult. You can also create a romantic, intimate mood by choosing from a range of fragrances designed for just this purpose! 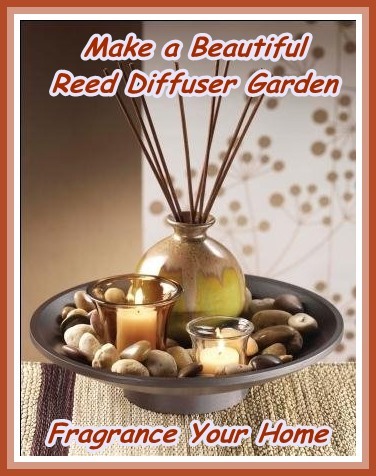 As mentioned previously, if you are a working person and don’t have much time to make and arrange a reed diffuser garden, you can buy it ready-made and there is a wide range to choose from. Click on the pictured examples above to see prices from Amazon.